The books just keep coming! It never ends! Yay! Click on the image or the title to access the title in our catalog. Books are listed alphabetical by author. New!! Look for the ♥♥ for a recommended read. As Old as Time (A Twisted Tale, v. 3), by Liz Braswell. Summary: Belle is a lot of things: smart, resourceful, restless. She longs to escape her poor provincial town for good. She wants to explore the world, despite her father’s reluctance to leave their little cottage in case Belle’s mother returns — a mother she barely remembers. Belle also happens to be the captive of a terrifying, angry beast. And that is her primary concern. But when Belle touches the Beast’s enchanted rose, intriguing images flood her mind — images of the mother she believed she would never see again. Stranger still, she sees that her mother is a beautiful Enchantress who cursed the Beast, his castle, and all its inhabitants. Shocked and confused, Belle must work with the Beast to unravel a dark mystery about their families that was twenty-one years in the making. Star-Crossed, by Barbara Dee. Summary: Star student Mattie is chosen to play Romeo opposite her crush, a newcomer named Gemma, in an eighth-grade production of Romeo and Juliet, a situation that makes her question her orientation about whether she can be attracted to both boys and girls. The List, by Patricia Forde. Summary: Letta, charged with collecting and saving words, uncovers a sinister plan to suppress language, robbing the people of Ark of the power of speech, and realizes she must also save the culture, itself. The Lake Effect, by Erin McCahan. Summary: The summer after senior year of high school, Briggs Henry works as a personal assistant to an eccentric elderly woman in a house on the shores of Lake Michigan, and finds himself distracted by the mysterious girl next door. The Disappearances, by Emily Bain Murphy. Summary: Every seven years, an important thing, like scent, disappears from the town of Sterling and Aila, sixteen, is determined to find the cause and how her recently-deceased mother was involved. ♥♥ The Lying Game, by Ruth Ware. Summary: The text message arrives in the small hours of the night. It’s just three words: I need you. Isa drops everything, takes her baby daughter and heads straight to Salten. She spent the most significant days of her life at boarding school on the marshes there, days which still cast their shadow over her. At school Isa and her three best friends used to play the Lying Game. They competed to convince people of the most outrageous stories. Now, after seventeen years of secrets, something terrible has been found on the beach. Something which will force Isa to confront her past, together with the three women she hasn’t seen for years, but has never forgotten. Adam is a recently diagnosed schizophrenic; he sees and hears people who aren’t there. He journals to his therapist as he undergoes a new drug trial. Maya, a fiercely intelligent girl he meets, makes Adam want to be the great guy she thinks he is. When the miracle drug begins to fail, can he keep Maya from discovering his secret? Endgame series, vols. 1 (“The Calling), 2 (“Sky Key“), and 3 (“Rules of the Game“), by James Frey. Summary of series: Twelve thousand years ago, they came. They descended from the sky amid smoke and fire, and created humanity and gave us rules to live by. They needed gold and they built our earliest civilizations to mine it for them. When they had what they needed, they left. But before they left, they told us someday they would come back, and when they did, a game would be played. A game that would determine our future. “The End (Enemy series vol. 7),” by Charlie Higson. Summary: Racing to London to warn the kids of an impending invasion by Saint George’s army, Shadowman struggles to convince Nicola, David, Matt, and the others that their forces must work together in order to survive. “Generation One (Lorien Legacies Reborn, vol. 1),” by Pittacus Lore. Summary: It has been one year since the breathtaking events of United as One–and our world will never be the same.The invasion of Earth was thwarted by our alien allies known as the Garde. But in order to do so, they unleashed their Loric energy and it spread throughout the globe. Now human teenagers have begun to develop incredible abilities–Legacies of their own. As the world tries to figure out how best to deal with the emergence of these powerful and potentially dangerous individuals, the Garde have come up with their own solution. They’ve created an academy where they can train this new generation to control their powers and hopefully one day help mankind…but that day may come sooner than any of them ever imagined. Perfect for fans of Rick Yancey’s The 5th Wave and Marvel’s X-Men, this epic new series follows a diverse cast of teens as they struggle to hone their powers and decide what, if anything, they should do with them. While set in the world of the #1 New York Times bestselling I Am Number Four series, those familiar with the original books and newcomers alike will devour this fast-paced, action-packed adventure. “A Court of Wings and Ruin (Court of Throne and Roses, vol. 3),” by Sarah Maas. Summary: Feyre has returned to the Spring Court, determined to gather information on Tamlin’s maneuverings and the invading king threatening to bring Prythian to its knees. But to do so she must play a deadly game of deceit-and one slip may spell doom not only for Feyre, but for her world as well. As war bears down upon them all, Feyre must decide who to trust amongst the dazzling and lethal High Lords-and hunt for allies in unexpected places. In this thrilling third book in the #1 New York Times and USA Today bestselling series from Sarah J. Maas, the earth will be painted red as mighty armies grapple for power over the one thing that could destroy them all. “The Thousandth Floor (Thousandth Floor, vol. 1),” by Katharine McGee. Summary: A hundred years in the future, New York is a city of innovation and dreams. But people never change: everyone here wants something…and everyone has something to lose. Leda Cole’s flawless exterior belies a secret addiction—to a drug she never should have tried and a boy she never should have touched. “Middle School Mayhem (The Misadventures of Max Crumbly, vol. 2),” by Rachel Renee Russell. Summary: When we last left our hero, Max Crumbly, he had crash-landed on top of a Mighty Meat Monster pizza after taking a late night tumble through the vents at South Ridge Middle School–and he was completely surrounded by three ruthless criminals! Will Max be shredded to bits like mozzarella cheese on the hard and crunchy pizza crust of doom? Can his friend and sidekick, computer whiz Erin, help get him out of this sticky situation alive? Queen’s Thief series, vols. 1 (“The King of Attolia“) and 2 (“The Queen of Attolia“), by Megan Whalen Turner. Summary of series: When Eugenides, the Thief of Eddis, stole Hamiathes’s Gift, the Queen of Attolia lost more than a mythical relic. She lost face. Everyone knew that Eugenides had outwitted and escaped her. To restore her reputation and reassert her power, the Queen of Attolia will go to any length and accept any help that is offered…she will risk her country to execute the perfect revenge. Click on the title or the image to access the record in our catalog. 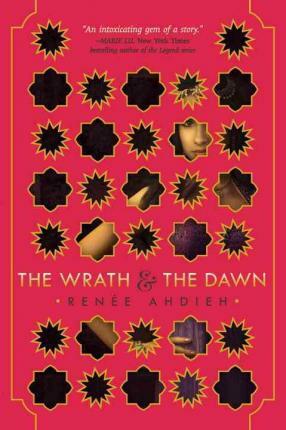 The Wrath and the Dawn (The Wrath and the Dawn series, vol. 1), by Renée Ahdieh. Summary: In this reimagining of The Arabian Nights, Shahrzad plans to avenge the death of her dearest friend by volunteering to marry the murderous boy-king of Khorasan, but discovers not all is as it seems within the palace. Flame in the Mist (Flame in the Mist series, vol. 1), by Renée Ahdieh. Summary: The daughter of a prominent samurai, Mariko has long known her place. She may be an accomplished alchemist, whose cunning rivals that of her twin brother Kenshin, but because she is not a boy, her future has always been out of her hands. Rebel of the Sands (Rebel of the Sands series, vol. 1), by Alwyn Hamilton. Summary: She’s more gunpowder than girl—and the fate of the desert lies in her hands. The Names They Gave Us, by Emery Lord. Summary: When her perfectly planned summer of quality time with her parents, her serious boyfriend, and her Bible camp unravels and long-hidden family secrets emerge, Lucy must figure out what she is made of and what grace really means. Lucy Hansson was ready for a perfect summer with her boyfriend, working at her childhood Bible camp on the lake and spending quality time with her parents. When her mom’s cancer reappears, her boyfriend “pauses” their relationship, and her summer job switches to a camp for troubled kids, Lucy falters in her faith. Then long-hidden family secrets emerge. Can Lucy set aside her problems and discover what grace really means? Book of the Night: The Black Musketeers, by Oliver Pötzsch. Summary: In this thrilling adventure by bestselling author Oliver Pötzsch, thirteen-year-old Lukas has been trained as a swordsman by his father, a nobleman who was once a famed Musketeer. When the threat of war and accusations of witchcraft spread across the land, Lukas’s life is forever changed. He flees his home and vows to find his missing sister. Surviving as an outcast, Lukas encounters thieves and mercenaries, a strange astrologer, and a master swordsman. He also meets three other fencers–Giovanni, Paulus, and Jerome. Each brings a special talent to their team that leads them to the Black Musketeers, the best fighters in the army. But living with the black-armored Musketeers is nothing like they imagined. In his quest to find his sister, Lukas learns of a legendary book that holds powerful magic. As he fights to keep the Book of the Night out of the hands of his greatest enemy, Lukas discovers the secrets of his own family and what it really means to be a Musketeer. 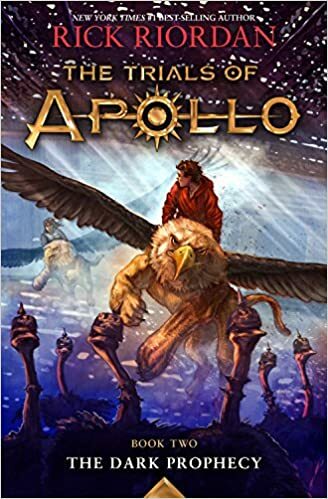 “The Dark Prophecy,” Rick Riordan’s long-awaited second installment of The Trials of Apollo! Check it out today! Summary: Zeus has punished his son Apollo–god of the sun, music, archery, poetry, and more–by casting him down to earth in the form of a gawky, acne-covered sixteen-year-old mortal named Lester. The only way Apollo can reclaim his rightful place on Mount Olympus is by restoring several Oracles that have gone dark. What is affecting the Oracles, and how can Apollo/Lester do anything about them without his powers? Teens’ Top Ten books are here! The Teens’ Top Ten picks are here! The Teens’ Top Ten is a “teen choice” list, where teens nominate and choose their favorite books of the previous year, so they’re YA books chosen by teens for teens! Nominators are members of teen book groups in fifteen school and public libraries around the country. You can learn more about the award here. Check on any of the images below to access the title in our catalog. Books are listed alphabetically by author. Click here for a list containing a short synopsis of each book. Crazy Messy Beautiful, by Carrie Arcos. Falling repeatedly in love but unable to succeed in the style of the poet who inspired his name, 16-year-old Neruda Diaz is partnered on a school assignment with a girl unlike anyone he typically falls for and discovers the magic and mess of a romance born from friendship. Read Publisher’s Weekly review here. Alex & Eliza, by Melissa de la Cruz. “Hamilton” for the YA set. The New York Times best-selling author of The Witches of East End and The Descendants series brings to life the romance between young Alexander Hamilton and Elizabeth Schuyler. Read the Historical Novel Society here. Hillary Rodham Clinton: A Woman Living History, by Karen Blumenthal. The author of Steve Jobs: The Man Who Thought Different presents an accessible, carefully researched portrait of the former first lady, senator and secretary of state that traces her unconventional upbringing, political achievements and devotion to activist causes. Read Publisher’s Weekly starred review here. Nightstruck (Nightstruck Series, vol. 1), by Jenna Black. Struggling with her parents’ divorce and high expectations while working on her college applications, Becket is tricked into opening a door between worlds and unleashing magical monsters into her Philadelphia community. Read Tor review here.